Los Angeles artist Sterling Ruby first exhibited his monumental urethane sculptures as part of MOCA Focus: Sterling Ruby, SUPERMAX 2008, an energetic show of painting, collage and sculpture. MOCA visits the artist in his studio for an exclusive look into his process. Born in 1972, on Bitburg Air Base, Germany, and raised in rural Pennsylvania, Sterling Ruby moved to Los Angeles to attend Art Center College of Design in Pasadena, CA. The highly prolific artist has maintained studios in the industrial outskirts of Los Angeles since 2003. Plunging into the damp basements and tagged streets of contemporary America, Ruby transforms iconographies of industriousness and virtuous craft into masochistic lamentations. Ruby vilifies the artistic gesture as a conditioned response, bound to a history that is, to him, at its best a crutch and at its worst a stifling prison. 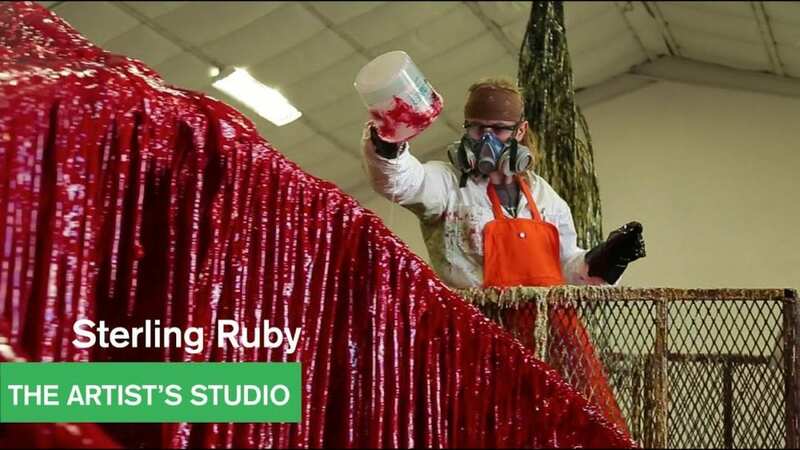 For the first time, film crews visit Ruby in his Vernon, California studio complex as he works with a team of assistants to create his famed urethane works. Ruby brings the camera inside the process, offering intimate views of the mixture of chemicals, application of urethane, and the heavy machinery used to invert and transport his works. Where once was the ecstatic solo dance of Jackson Pollock is now the clandestine construction in the studio with Sterling Ruby as its fastidious foreman. The comparison to a laboratory—be it scientific or street drug—is altogether welcome. Filmed on location in Los Angeles, summer 2013. Posted in ASX.TV, Painting and tagged Los Angeles, Sterling Ruby.